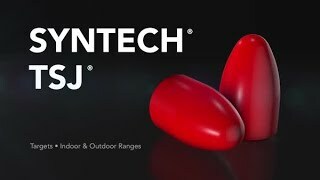 With an exclusive TSJ™ polymer jacket that eliminates copper fouling and decreases heat and friction, American Eagle® Syntech® loads have redefined the range ammunition category. Now handloaders can get the benefits of the same groundbreaking design in Syntech component bullets. The advanced range projectiles provide clean, accurate, consistent performance, as well as less splash-back on steel targets.